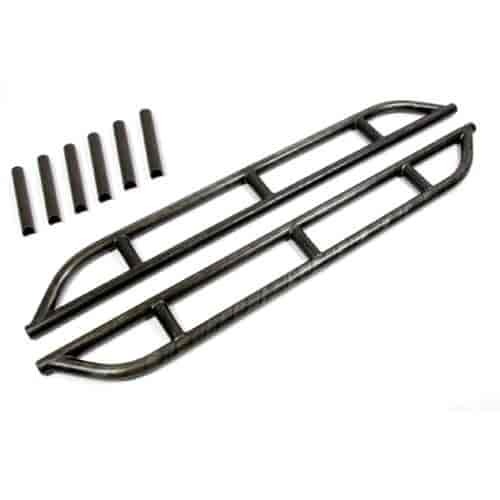 Trail Gear rock slider kits are designed to protect rocker panels by creating a smooth surface for the vehicle to slide over jagged rocks. Mounting legs are extra long so sliders can be used as step bars if desired, but legs can be cut to suit your preference. Rock Sliders also provide a secure point for a high-lift jack. 120002-1-KIT - Trail Gear Rock Slider Kits is rated 5.0 out of 5 by 1. Rated 5 out of 5 by Bigrichwalk from Better than expected!! Better quality then I expected! Ordering the rock sliders was a smooth transaction and installing them was pretty easy. The welds were high quality and the rock sliders are heavy duty and strong. I primed them and then shot a heavy coat of xtreme liner on them.